Included below are our District’s Annual Reports, Audit Reports, and Other Budget Related Reports. The Annual Reports are a summary of financial and programmatic activities, staffing summaries and performance feedback. To view a copy of an audit or budget report for the Lake Cumberland District or for one of the local health departments, go to the special purpose government entities web page here: SPGE Public Portal page. 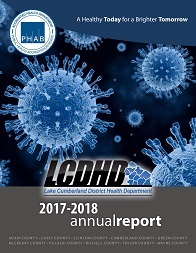 Once on the page, in the “SPGE Name/Type” field, type in, “Lake Cumberland District Health Department” for the district results; or, for example, Adair County Public Health Taxing District, for a local health department, then click the “Search” button. The Check Register includes a list of payables.